With so much at stake, we need to do a better job of understanding the risks of potentially catastrophic technologies. In 1965, Irving John ‘Jack’ Good sat down and wrote a paper for New Scientist called Speculations concerning the first ultra-intelligent machine. Good, a Cambridge-trained mathematician, Bletchley Park cryptographer, pioneering computer scientist and friend of Alan Turing, wrote that in the near future an ultra-intelligent machine would be built. This machine, he continued, would be the “last invention” that mankind will ever make, leading to an “intelligence explosion” – an exponential increase in self-generating machine intelligence. For Good, who went on to advise Stanley Kubrick on 2001: a Space Odyssey, the “survival of man” depended on the construction of this ultra-intelligent machine. Fast forward almost 50 years and the world looks very different. Computers dominate modern life across vast swathes of the planet, underpinning key functions of global governance and economics, increasing precision in healthcare, monitoring identity and facilitating most forms of communication – from the paradigm shifting to the most personally intimate. Technology advances for the most part unchecked and unabated. While few would deny the benefits humanity has received as a result of its engineering genius – from longer life to global networks – some are starting to question whether the acceleration of human technologies will result in the survival of man, as Good contended, or if in fact this is the very thing that will end us. Now a philosopher, a scientist and a software engineer have come together to propose a new centre at Cambridge, the Centre for the Study of Existential Risk (CSER), to address these cases – from developments in bio and nanotechnology to extreme climate change and even artificial intelligence – in which technology might pose “extinction-level” risks to our species. “At some point, this century or next, we may well be facing one of the major shifts in human history – perhaps even cosmic history – when intelligence escapes the constraints of biology,” says Huw Price, the Bertrand Russell Professor of Philosophy and one of CSER’s three founders, speaking about the possible impact of Good’s ultra-intelligent machine, or artificial general intelligence (AGI) as we call it today. We Homo sapiens have, for Tallinn, become optimised – in the sense that we now control the future, having grabbed the reins from 4 billion years of natural evolution. Our technological progress has by and large replaced evolution as the dominant, future-shaping force. We move faster, live longer, and can destroy at a ferocious rate. And we use our technology to do it. AI geared to specific tasks continues its rapid development – from financial trading to face recognition – and the power of computing chips doubles every two years in accordance with Moore’s law, as set out by Intel founder Gordon Moore in the same year that Good predicted the ultra-intelligence machine. We know that ‘dumb matter’ can think, say Price and Tallinn – biology has already solved that problem, in a container the size of our skulls. That’s a fixed cap to the level of complexity required, and it seems irresponsible, they argue, to assume that the rising curve of computing complexity will not reach and even exceed that bar in the future. The critical point might come if computers reach human capacity to write computer programs and develop their own technologies. This, Good’s “intelligence explosion”, might be the point we are left behind – permanently – to a future-defining AGI. Price and Tallinn stress the uncertainties in these projections, but point out that this simply underlines the need to know more about AGI and other kinds of technological risk. 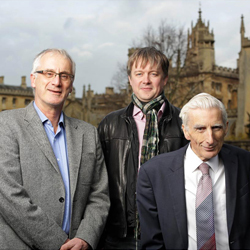 In Cambridge, Price introduced Tallinn to Lord Martin Rees, former Master of Trinity College and President of the Royal Society, whose own work on catastrophic risk includes his books Our Final Century (2003) and From Here to Infinity: Scientific Horizons (2011). The three formed an alliance, aiming to establish CSER. “What better place than Cambridge, one of the oldest of the world’s great scientific universities, to give these issues the prominence and academic respectability that they deserve?” he adds. “We hope that CSER will be a place where world class minds from a variety of disciplines can collaborate in exploring technological risks in both the near and far future. For more information on this story, please contact Fred Lewsey (fred.lewsey@admin.cam.ac.uk) at the University of Cambridge Office of External Affairs and Communications.